The process used to create a gel candle is different from the process used to create a paraffin wax candle. Unlike a wax candle, gel candles cannot be poured into molds. The gel is not stable enough to stand alone, so the shape of the gel candle comes from the container. Gel candles come in a wide range of glass containers. 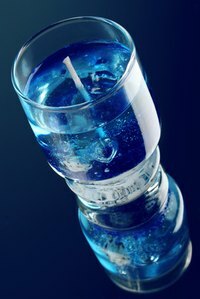 You can use everyday items, such as champagne glasses and fish bowls, to hold the gel. Decorating a gel candle involves suspending items inside the gel. Suspending pressed flowers in the gel will add color and texture to the candle. Wash out the glass container you are using for your candle. Allow the container to dry completely. Glue the metal end of the candle wick to the inside bottom of the glass container. Use a piece of tape to secure the wick onto the dowel. Pull the wick up and wind it around the dowel. Allow the dowel and wick to rest across the top of the glass container. This will keep the wick centered and upright during the pouring process. Place the desired amount of gel into the measuring cup. Use enough gel to fill the container that you chose. Place the gel into the preheated oven for one hour to melt. Remove the melted gel. Place the candy thermometer into the gel. The temperature of the gel should be 225 degrees F. Return the gel to the oven if it has not yet reached 225 degrees F. Check the gel every five minutes until it is the correct temperature. Leave the candy thermometer in the gel after removing the gel from the oven. If desired, add fragrance after letting the temperature of the melted gel drop below 225 degrees F. Follow the manufacturer's instructions for how much fragrance to add to the gel. Pour the gel as soon as it has cooled down to a temperature between 185 and 200 degrees F. Avoid pouring the gel directly on the dowel rod. Pour as much gel into the container as you desire. Place a pressed flower on top of the soft wax. Use the skewer to push the flower down into the wax and into the desired position. Allow the gel to cool. Unroll the wick from the dowel rod. Use scissors to cut the wick about 1 inch from the top of the gel. Place other non-flammable objects in the gel to achieve other effects. Seashells, marbles and glitter are all interesting additions to gel candles. Adding a couple more drops of fragrance will give you a stronger smelling candle. You can also color gel wax using a gel wax dye. Use caution when working around the hot wax. It will burn you if it gets on your skin. Do not let young children pour the wax into the glass container. Never use a plastic container when making a gel candle. The hot wax will melt through the plastic. Melt the wax only in a well-ventilated room.